In a previous blog post, a sketch was provided concerning the life and genealogy of Colonel Isaac C. B. Suman. Suman was reportedly the second individual in Porter County to volunteer for service in the Civil War. He initially enrolled as a private in Company H of the 9th Indiana Volunteer Infantry and was quickly elected to serve as the company's first lieutenant. This regiment would be more popularly known as the "Bloody Ninth" due to its participation in a large number of significant battles, as well as due to the losses it incurred in those battles. Ambrose Bierce, considered one of America's most highly regarded short story authors, was also a member of the Bloody Ninth. Bierce's short story, Occurrence at Owl Creek Bridge, (La Rivière du hibou), was made into short film directed by Robert Enrico in 1962. The film would earn an Oscar from the Academy of Motion Pictures and Sciences for short films that year. Occurrence at Owl Creek Bridge would be released in the United States on February 28, 1964, when it was televised as an episode on The Twilight Zone. Chickamauga, Horseman in the Sky, and One of the Missing are other notable Civil War short stories penned by Bierce; his stories were some of the first to plainly and vividly illustrate the brutality of the conflict that he witnessed as a member of the Bloody Ninth. Gilbert A. Pierce was another Porter County resident that volunteered for military service. Like Suman, Pierce also enlisted with Company H of the 9th Indiana Volunteer Infantry. He was immediately commissioned a second lieutenant and, after three months service and reenlistment, was promoted to captain. After the war, Pierce would lead a rather fascinating and active life. Mariette (McDuffie) Pierce (age 17; b. January 18, 1831, d. January 14, 1903), wife of Emmons, was also residing in the Sylvester Pierce household. All the Pierce children were born in New York. It is possible that Sylvester and Olive were the parents of another daughter, Minerva, who married a John Liang. Photograph of Gilbert Ashville Pierce. Source: Collection of Rebecca J. Evans. Sylvester and Olive Pierce, along with their three youngest children - Laura, Gilbert, and Ellen, moved to Tassinong in Morgan Township, Porter County, Indiana, in 1856. It is unknown what induced the family to move there. Tassinong, an old Native American trading site, was officially platted in September 1852, four years prior to the Pierce's arrival. It is possible that the Pierce's moved there speculating that since the village was new it would experience growth and provide the family financial opportunities and security. Gerald (b. 1860, d. 1952) - married a woman named Elsie J. Gerald was publisher of the Minneapolis Tribune and the Chicago Record Herald. Paul B. (b. June 1865) - would become secretary of the Society for the Promotion of Purity in Food Products. Paul was considered a pioneer in the pure food movement of the early 1900s. Married Sarah L.
Mary O. (b. June 1869)- married Dr. Reverend Robert Scott Inglis of Newark, Essex County, New Jersey. Ellen - married James Augustus Haight of Seattle, King County, Washington. Through marriages, the Pierce and Bartholomew family were closely intertwined. Gilbert's sister, Laura Pierce, married his brother-in-law, Eli A. Bartholomew. The 1860 Federal Census for Morgan Township lists both Sylvester and his son Gilbert as being merchants in the small village of Tassinong; it is believed that Gilbert was clerking in his father's general store and not competing directly against him. Gilbert's sister, Ellen, would die at the age of 15 on September 11, 1860, and be interred at Adams Cemetery in Morgan Township. Sylvester would serve as the tenth postmaster of Tassinong, being appointed on April 27, 1869, until being replaced by Calvan Bowman on May 29, 1885. 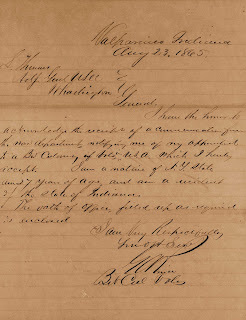 Gilbert enlisted with Company H, 9th Indiana Volunteer Infantry on April 23, 1861. He was immediately commissioned a second lieutenant and after three months service his unit was mustered out of service on July 29, 1861. The unit was immediately mustered back into service and Pierce was promoted by President Abraham Lincoln to captain and assistant quartermaster on August 3, 1861. Pierce would serve under General Ulysses S. Grant at Paducah, Fort Donelson, Shiloh, Grand Gulf, and Vicksburg. As assistant quartermaster, Pierce would have been responsible for the development, production, acquisition, and sustainment of the supplies for General Grant's troops. Upon the personal written recommendations of Brigadier Generals Marcellus M. Crocker, John McArthur, and Thomas E. G. Ransom, Major Generals William T. Sherman and Ulysses S. Grant, and the Speaker of the United States House of Representatives Schuyler Colfax, Gilbert A. Pierce was appointed to the position of lieutenant colonel in the Quartermaster's Department on September 12, 1863. Crocker noted that Pierce was "one of the best officers of his department in the service" and that he should be granted a promotion "for his faithfulness and ability." Pierce was promoted once again to the position of colonel and inspector of the Quartermaster's Department on March 2, 1864, serving in the southern United States until October 1865, when he retired from the United States Army. I have the honor to acknowledge the receipt of a communication from the war department, notifying me of my appointment to a Bvt Calvary of Vols, in U.S.A. which I hereby accept. I am a native of N. Y. State, am 27 years of age, and am a resident of the state of Indiana. The oath of office, filled up as required is enclosed. After his promotion to brevet colonel, Pierce would soon muster out of the United States Cavalry on October 7, 1865.
accepting a position with the United States Cavalry, August 23, 1865. M1064, Record Group 94, Roll 0200. Unfortunately, little is known of Gilbert Pierce's activities between October 1865 to 1869. It is suspected that he may have been employed at his father's store. Alternatively, one biographical sketch mentions that Gilbert returned to Valparaiso after the war and practiced law and journalism. It has been mentioned in several biographical sketches that Gilbert entered the Law Department at the University of Chicago. Confusion arises since some sources state that he was studying at the University of Chicago prior to the outbreak of the war, while others suggest that he studied law at the University of Chicago after returning home from the war. It is interesting to note that the University of Chicago Law School did not formally exist until 1902. In fact, the current University of Chicago was not established until 1890. It is much more likely that Gilbert Pierce attended the Union College of Law of the "old" University of Chicago, which was a Baptist affiliated college that existed in Chicago from 1857 to 1886. When the old University of Chicago went defunct, its law school was taken over by Northwestern University and became known as Northwestern Law. While attending college in Chicago, Pierce would also study writing and literature, two disciplines that he would put to productive use. Upon completion of his law studies, Gilbert started a law practice in Valparaiso with his brother-in-law Alvin David Bartholomew, a brother of Eli and Anna Maria. A. D. Bartholomew, a former resident of the Tassinong area, also attended the old University of Chicago and likely motivated Gilbert to attend the school and seek a law degree. Gilbert's practice of law at Valparaiso was apparently quite short. He was elected to serve one term in the Indiana House of Representatives in 1868, and then he served as Assistant Financial Clerk of the United States Senate from 1869 to 1871. It is likely that he received his United States Senate employment through the assistance of Senator Oliver H. P. T. Morton, an influential senator and former governor of Indiana. Upon leaving Washington, D.C., Pierce moved to Chicago where he had accepted a position as an associate editor at the Chicago Inter Ocean newspaper. The Chicago Inter Ocean was under the management of Elijah W. Halford who later served as President Benjamin Harrison's private secretary. Pierce would soon become closely connected with Harrison and remain a lifelong acquaintance. Gilbert would remain with the newspaper for twelve years, departing at a time when he was serving as its managing editor to work for the competing Chicago Daily News. During the 1870s and early 1880s, besides working as an editor at the Chicago Inter Ocean, Pierce blossomed into an author and playwright. In 1872, Pierce would publish The Dickens Dictionary: A Key to the Characters and Principal Incidents in the Tales of Charles Dickens, with coauthor William Adolphus Wheeler. Wheeler, a native of Massachusetts and a noted American lexicographer, had been conferred a Master in Arts degree from Harvard University the year prior to the publication of the Dickens Dictionary. This was a reference book that was used widely in the United States and Great Britain that focused on every novel, play, poem, and short story written by Charles Dickens. The book is still often cited today, nearly 150 years after its publication, by academics studying the work of Dickens. Literature must have been a keen interest within the Pierce family. 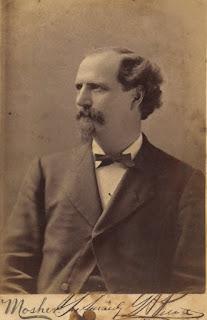 Emmons Sylvester Pierce, Gilbert's older brother, was an acquaintance of Samuel Clemens (Mark Twain) and authored a book titled Poems of the Turf and Other Ballads, which was about race horses and published in 1890. Emmons, who owned and raced horses, was considered Twain's doppelgänger. Emmons' appearance was so similar to Twain's that Twain insisted on personally meeting Emmons, which he did and afterward they remained friends. It deals with the adventures, trials, temptations, and love affairs of a country politician elevated to seat in Congress. Those conversant with country politics will undoubtedly enjoy the story and find in it much that is amusing.... It is an American novel, if not the American novel. Zachariah, the Congressman was well received by other reviewers, several of whom questioned in their review as to whom Pierce used as the model for the character Zachariah. Also in 1880, One Hundred Wives, a play Pierce co-wrote with James B. Runnion, a fellow employee at the Chicago Inter Ocean, was released. The similarities between Runnion and Pierce are uncanny. Runnion was a native of Lafayette, Tippecanoe County, Indiana. Like Pierce, Runnion attended the "old" University of Chicago, quite possibly at the same time as Pierce. Runnion would enlist as a West Virginian volunteer cavalry regiment for the Union Army at the beginning of the Civil War and, like Pierce, rise to the rank of colonel. After the war, Runnion traveled to Europe and earned a degree in law from the University of Berlin. He would return to United States to become an associate editor of the Chicago Times, managing the literary and fine arts departments of that newspaper. From 1872 to 1874, Runnion would be the managing editor of The Chicago Tribune; he would conclude his career with the Kansas City Star. Advertisement for Gilbert A. Pierce's play 100 Wives. Source: The Decatur Morning Herald, January 26, 1882. The route to success for a playwright was (and still is) much different than that for a book author. Pierce and Runnion would be required to contract a theater company willing to produce their play. The Criterion Comedy Company of Chicago, a theatrical touring company managed by Jacob Gosché, would be the first major theater company to produce One Hundred Wives. The Criterion Comedy Company was organized and owned by William DeWolf Hopper, who used $50,000 inherited from his father to capitalize his company. Hopper, who was just beginning his career as an actor, took on the lead role in One Hundred Wives. He would have an acting career spanning 56 years and his most memorable role was his recitation of Ernest Lawrence Thayer's Casey at the Bat. Ironically, Hopper would marry multiple times, one of his six wives being famed gossip columnist Hedda Hopper. 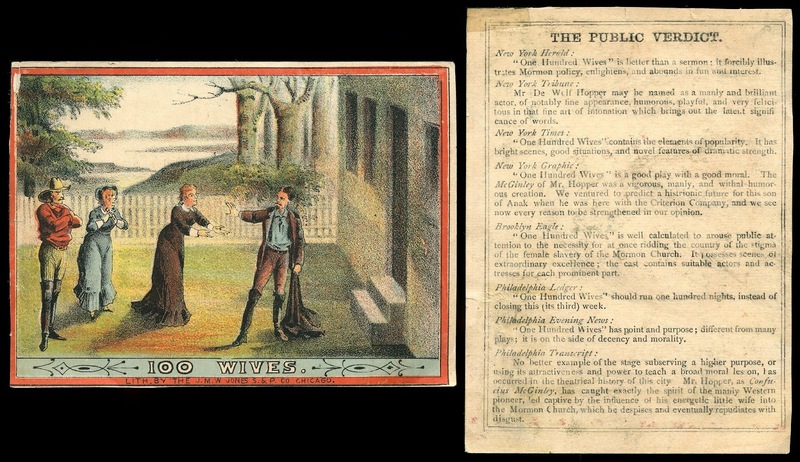 Trade card for Gilbert A. Pierce's play 100 Wives. Source:Collection of Steven R. Shook. In these days, when the public mind is so thoroughly engrossed with the Mormon problem, Messrs. Pierce and Runnion's great play depicting the horrors and infamies of that abominable sect is worth volumes of books and series of lectures in giving the uninitiated an insight into the inner life of the Latter Day Saints. "One Hundred Wives" is a melo drama of the better type, replete with exciting situations, well put on and excellently acted. The drama is intended to be a sermon against Mormonism, and it will doubtless have the effect of increasing and intensifying popular indignation against the polygamists of Utah.... It is a good play, with a good moral, and possesses all the elements of popularity. The play was produced for several years by numerous companies, but then faded a bit after the Latter-day Saints banned plural marriages in 1890. One Hundred Wives was brought back to the stage in 1907 and was produced for a few years afterward. Interestingly, Hopper's Criterion Comedy Company never turned a profit on its production of One Hundred Wives and the company would go defunct. Pierce, still employed with the Chicago Inter Ocean, would continue to write novels. On June 16, 1883, R. R. Donnelley & Sons would publish Pierce's second book titled Peggy: A Country Heroine: A Tale of American Society. Peggy was similar in concept and style to Pierce's Zachariah, but it appears to have been less successful than Pierce's first novel. We confess to being seriously prejudiced against "A Dangerous Woman," by Gilbert A. Pierce (Chicago: H. A. Sumner & Co.), by the numerous wood-cuts in the ludicrous extreme of badness, and of the kind often found in railroad literature. The story, however, is better than the pictures - it couldn't be worse. Though extremely sensational, there is considerable evidence that the author is capable of better work. He introduces his characters and relates the remarkable incidents of their careers with an ease and gayety that indicate a latent power to write a very respectable novel, if he would concoct a reasonable plot and describe human beings. In "A Dangerous Woman" we have a general's aide-de-camp take to brick-laying after failing to obtain a government clerkship, and thence rising to the position of master-builder, lecturer on the "labor question," and member of Congress. The principal character, however, is a woman of the "beautiful fiend" variety, whose exploits as spy, traitor, lobbyist, forger, robber, abductor, and would-be murderer are "lurid" in the highest degree. 'A DANGEROUS WOMAN,' by Gilbert A. Pierce (Henry A Sumner & Co.) is an unnatural, sensational, and exceedingly poor story about an unscrupulous woman whose like never existed. If anything could be worse than the literary part of it, it is the illustrations. Even the idle hours of a railway-journey would be wasted over such unmitigated trash as Mr. Gilbert A. Pierce's "A Dangerous Woman." An adverturess of the worst type.... The author of this book has drawn a picture of female depravity hardly matched for hideousness by the abominable illustrations which are supposed to adorn this volume. Of the excruciating tortures the least artistic eye must suffer in contemplating the latter, we refuse to speak. Perhaps sensing a challenge in his occupation as a writer, Gilbert Pierce started becoming quite active in Republican politics in the early 1880s. He attended the Republican National Convention in Chicago in 1884 where he lobbied delegates to nominate Chester A. Arthur, who had become president in 1881 when President James A. Garfield was assassinated. Soon after the Republican National Convention, on June 25, 1884, Gilbert Pierce was appointed Territorial Governor of North Dakota by President Arthur. This was likely a patronage appointment. Pierce replaced Nehemiah G. Ordway, whom President Arthur had removed from office since he had been indicted on charges of corruption; Ordway had allegedly accepted a bribe from James W. Shaw in return for appointing Shaw as a commissioner in Potter County. In November 1884, President Arthur lost reelection to Grover Cleveland. As was customary in presidential transitions, Pierce tendered his resignation to Cleveland, but President Cleveland declined to accept the resignation and Pierce would remain the territorial governor of North Dakota until November 1886 when he resigned the position. In 1887, the territorial legislature honored Pierce for his service by naming Pierce County after him. In the presidential election of 1888, President Cleveland would lose to Hoosier Republican Benjamin Harrison. Upon Harrison's occupation of the White House in 1889, Pierce would lobby officials in Washington, D.C. in earnest for the separation of the Dakotas and the creation of two new states. Pierce's lobbying was successful - North Dakota and South Dakota would enter the Union as separate states by the end of the year (November 2). Very likely due to his efforts to assist North Dakota in achieving statehood, Pierce was selected by the legislature of North Dakota in 1889 to serve as the state's first senator in Washington, D.C. As a senator, Pierce would involve himself with tariff protection and trade bills, with special focus on the reciprocal trade agreement with Canada (McKinley Tariff Act of 1890). After his term expired in 1891, Pierce would return to the newspaper business as a publisher, purchasing the Minneapolis Tribune in partnership with William J. Murphy for $450,000 (equivalent to $12 million in 2016). 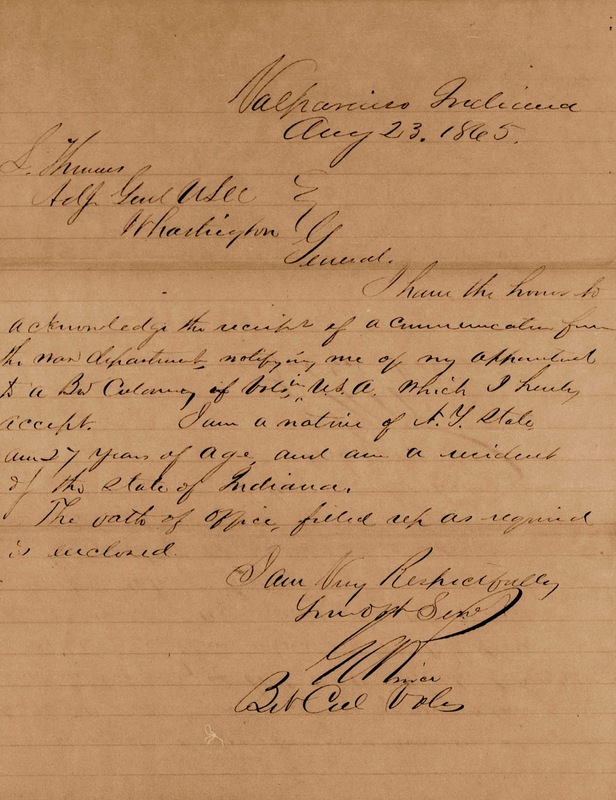 On January 4, 1893, President Benjamin Harrison nominated Gilbert A. Pierce to be Minister and Consul General to Portugal at Lisbon, which was confirmed the following day by the United States Senate. Pierce, however, would soon forward his resignation to the State Department on March 28 due to his poor health and be replaced by George William Caruth. Interestingly, Charles A. Dana, the powerful editor of the New York Sun, and a former Assistant Secretary of War (1863-1865), published a column shortly after Pierce's appointment accusing Pierce of drawing a salary from the United States Government though he had been absent for an extended period of time from his post in Portugal. It should be noted that Dana managed the newly established Republican, a partisan newspaper in Chicago, from 1865 to 1866. Ironically, the Republican newspaper would be relaunched in 1872 as the Chicago Inter Ocean, with Gilbert A. Pierce serving as an editor and writer of published plays, novels, and sketches. In 1877, Pierce would become the managing editor of the Chicago Inter Ocean. Thus, a connection existed between Pierce and Dana through their work as editors at the Chicago newspaper. This being the fact, do you not owe me an apology? Not the sort which is worse than the original attack, but a frank square admission that, whatever my shortcomings, however weak a representative of the country I may be -- entirely independent of whether I have earned my salary or not -- I am not a violator of the statute and have not been preying upon an innocent government by drawing money without warrant of law. One is left wondering if this was simply a personal feud between two former Civil War participants and newspaper editors or whether there was a kernel of truth in Dana's editorial? Perhaps Pierce resigned because of Dana's editorial. It is well known that Pierce's health was poor due to asthma long before to his appointment to Portugal, so using his health as the rationale for his resignation can certainly give the knee-jerk appearance of being disingenuous. Gilbert Pierce resided in Minnesota in 1893 after returning from Europe. Due to poor health caused by asthma, Pierce would sell his interest in the Minneapolis Tribune to his partner, William J. Murphy. Murphy would lead the newspaper to being one of the most influential news publications in the Midwest. When Murphy passed away in Chicago in 1918 due to contracting influenza, his estate made a bequest of $350,000 to establish the School of Journalism at the University of Minnesota (equivalent to $5.5 million in 2016). After selling his newspaper interest in Minnesota, Pierce would reside in Colorado, Florida, Illinois, and New York in an effort to improve his health. He remained involved in Republican politics, focusing a significant amount of his efforts in attempting to see Benjamin Harrison back in the White House. Correspondence between Harrison and Pierce show that Pierce was certain that Governor of New York, Theodore Roosevelt would receive the Republican nomination for president in 1900; Pierce was strongly opposed to President William McKinley's nomination. McKinley, however would win the Republican nomination by a single vote and then proceed to win reelection as president by trouncing his Democratic opponent, William Jennings Bryan. In 1900, Pierce would assist his two sons, Gerald and Paul, in forming the Pierce Publishing Company. This company would create a new genre of periodicals in the United States - those focused on food and cooking. The company's What to Eat magazine, later retitled Table Talk: The National Food Magazine, was quite successful with Paul Pierce serving as the managing editor. The magazine would again be retitled more simply as National Food Magazine. The Pierce Publishing Company would also produce The International Culinary Magazine, which focused on the art of cooking. The Pierce brothers were also quite active and influential in lobbying for pure food legislation in the United States during the early 1900s. Their work, along with other pure food advocates such as Upton Sinclair, who published The Jungle on February 26, 1906, an alarming exposé of the Chicago stockyards and meatpacking industry, led to the Pure Food and Drug Act of 1906. President Theodore Roosevelt would give his famous "The Man with the Muck Rake" speech on April 15, 1906, a clear reference to a character in John Bunyan's The Pilgrim's Progress who was so intensely focused on "raking the filth at his feet" that he failed to look up and "behold the celestial crown." Roosevelt's speech was largely motivated by the pure food advocates and a publisher named Samuel S. McClure, whose McClure's Magazine sharply focused its articles on the underbelly of American industry and politics. In an interesting twist, McClure was raised in the Porter County communities of Hebron and Valparaiso, and he would launch the careers of such noted writers as Willa Cather, Lincoln Steffens, Ida Tarbell, and William Allen White. Obituary published for Gilbert Ashville Pierce. Source: The Chesterton Tribune, February 22, 1901. Gilbert Ashville Pierce would not live long enough to see the fruits of success resulting from the formation of the Pierce Publishing Company. 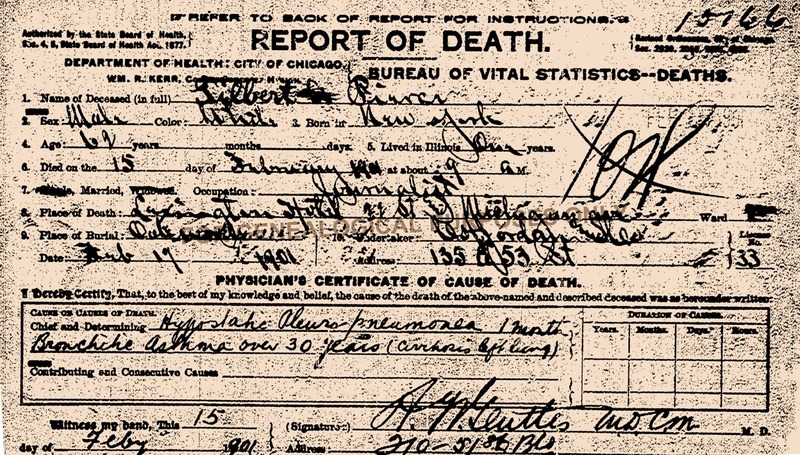 At around 9:00 am on February 15, 1901, at the Lexington Hotel in Chicago, surrounded by his family, Gilbert died at the age of 62. Pierce's cause of death was attributed to pneumonia and asthma, and he had been quite ill for some time prior to passing away. The Reverend Robert Beer, a close friend of Gilbert's and the minister at Valparaiso's Presbyterian Church, would officiate Pierce's funeral service in Chicago on February 17. Gilbert's remains would be interred in the family plot at Morgan Township's Adams Cemetery in Porter County. 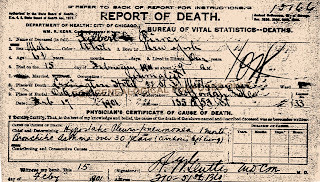 Report of Death issued for Gilbert A. Pierce dated February 15, 1901. Source: Cook County Clerk's Office, Cook County, Illinois. Details concerning the funeral of Gilbert A. Pierce. 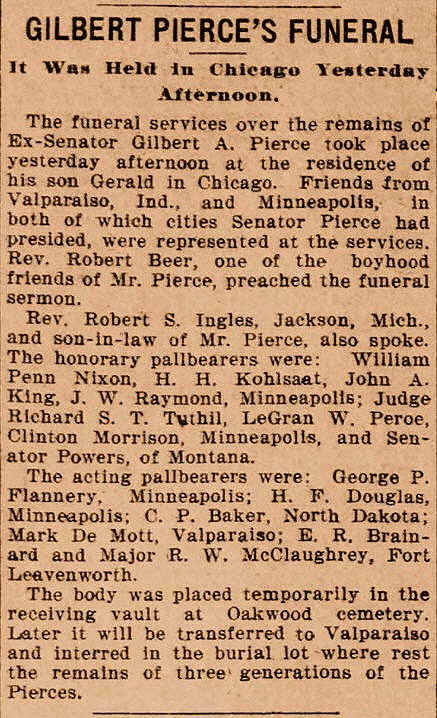 Source: The Minneapolis Journal, February 18, 1901.
death of his brother, Gilbert A. Pierce. Lanman, Charles, and J. M. Morrison. 1887. Biographical Annals of the Civil Government of the United States: From Original and Official Sources. Second Edition. New York, New York: J. M. Morrison. 568 p. [see p. 393]. Pierce, Emmons Sylvester. 1890. Poems of the Turf and Other Ballads. Buffalo, New York: The Wenborne-Sumner Company. 125 p.
Pierce, Gilbert A. 1872. The Dickens Dictionary: A Key to the Characters and Principal Incidents in the Tales of Charles Dickens. Boston, Massachusetts: James R. Osgood and Company. 573 p.
Pierce, Gilbert A. 1880. Zachariah, the Congressman: A Tale of American Society. Chicago, Illinois: Henry A. Sumner & Company. 440 p.
Pierce, Gilbert A. 1883. Peggy: A Country Heroine. A Tale of American Society. Chicago, Illinois: R. R. Donnelley & Sons. 440 p.
Pierce, Gilbert A. 1884. A Dangerous Woman: Being the Experience of the Hon. John Billings, M. C. Chicago, Illinois: Henry A. Sumner & Company. 505 p.
Sinclair, Upton. 1906. The Jungle. Doubleday, Jabber & Company. 475 p.
Anonymous. 1883. Reviews. Good Literature - An Eclectic Literary Weekly 5(154):309. Anonymous. 1884. Recent Fiction. The Critic and Good Literature 1:32. Anonymous. 1907. News from the Classes. The Chicago Alumni Magazine 1(6):254. Anonymous. 1916. Editorials: Our Twentieth Anniversary. Table Talk: The National Food Magazine 41(5):5-7. Schlup, Leonard. 1997. Gilbert A. Pierce and Republican Party Politics in the Harrison Era. Nanzan Review of American Studies 19(1):85-99. Minneapolis Daily Tribune, Minneapolis, Hennepin County, Minnesota; June 29, 1871; Volume 5, Number 31, Page 1, Column 3. Column titled "The East. Harvard Commencement." The Inter Ocean, Chicago, Cook County, Illinois; December 18, 1875; Volume 4, Number 230, Page 5, Columns 3-6. Column titled "Zachariah, The Congressman -- A Tale of American Society," by Colonel Gil Pierce. The Chicago Daily Tribune, Chicago, Cook County, Illinois; March 13, 1880; Volume 40, Page 9, Columns 5-6. Column titled "Minor Notices." The Decatur Morning Herald, Decatur, Macon County, Illinois; January 26, 1882; Volume 2, Number 98, Page 3, Column 2. Advertisement for stage performance of One Hundred Wives. The Decatur Morning Herald, Decatur, Macon County, Illinois; January 26, 1882; Volume 2, Number 98, Page 3, Column 4. Column titled "One Hundred Wives." The Bismarck Tribune, Bismarck, Burleigh County, North Dakota; January 4, 1884; Volume 11, Number 31, Page 5, Columns 3-4. Column titled "Denial of Charges." The Chicago Daily Tribune, Chicago , Cook County, Illinois; March 24, 1884; Volume 44, Page 9, Column 4. Column titled "Brief Notices." St. Paul Daily Globe, St. Paul, Ramsey County, Minnesota; January 5, 1893; Volume 15, Number 5, Page 4, Column 5. Column titled "Pierce Remembered. The Editor Nominated as Minister to Portugal." Bismarck Weekly Tribune, Bismarck, Burleigh County, North Dakota; March 31, 1893; Volume 20, Page 1, Column 1. Column titled "Washington News." The Sunday Tribune, Minneapolis, Hennepin County, Minnesota; May 28, 1893; Volume 27, Number 16, Page 28, Column 4. Column titled "Hits Back at Dana." The Upper Des Moines, Algona, Kossuth County, Iowa; June 21, 1893; Volume 28, Number 13, Page 2, Column 2. Column titled "Condensed News." The Minneapolis Journal, Minneapolis, Hennepin County, Minnesota; February 18, 1901; Page 7, Column 2. 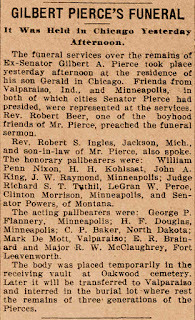 Column titled "Gilbert Pierce's Funeral." The Chesterton Tribune, Chesterton, Porter County, Indiana; February 22, 1901; Volume 17, Number 46, Page 5, Column 2. Column titled "Gilbert A. Pierce Dies." The Sun, New York, New York County, New York; March 4, 1911; Volume 78, Number 185, Page 4, Column 6. Column titled "Pure Food in Hotels. Stewards Urged To See That Wholesome Materials Only Are Used." The Indianapolis News, Indianapolis, Marion County, Indiana; June 19, 1916; Volume 47, Number 168, Page 5, Column 5. Column titled "Indiana Deaths." The Daily Democrat, Tallahassee, Leon County, Florida; May 10, 1931; Volume 17, Number 150, Page 1, Column 1. Column titled "Mrs. Gerald Pierce Dies at Lake Wales." The Vidette-Messenger, Valparaiso, Porter County, Indiana; October 13, 1934; Volume 8, Page1, Columns 4-5 and Page 7, Columns 3-4. Column titled "Siftings Gleaned Hither and Yon -- and Now and Then -- and Way Back When," by A. J. Bowser."